We�re pleased to offer a very special piece from this new and very talented carver. This clock features very detailed carvings done in rare black Arenga wood. The detailed carvings on this clock are not stained or painted in any way. you are looking at the actual natural color of the wood. This wood is also naturally lubricating and the soft sheen is very beautiful. 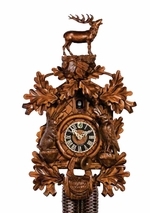 There is a long tradition of antique Black Forest clocks to have beautifully hand-carved bone hands. This clock extends that tradition with its delicately carved real bone hands. Notice the exceptional detail on the birds� wings, the feathers and beaks. Each leaf is carefully carved with fantastic expression. The bird on top is carved all the way around � even where you don�t see it in the back.